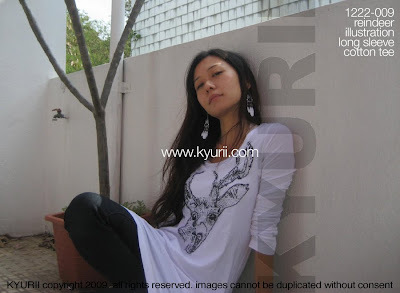 a little kyurii a day: NEW IN! hey girls, full preview tonite! these new items will be up tomorrow morning! as mentioned earlier, yes spring has pre-maturedly arrived for us. haha.. we decided to do a rather sporty, uplifting collection this week! you will see magenta, soft pink, pale purple and we mix it with shades of deep blue and grey. we are really excited about this collection. this little hoodie cropped tee comes in 2 colours, dark magenta (above) and light grey. 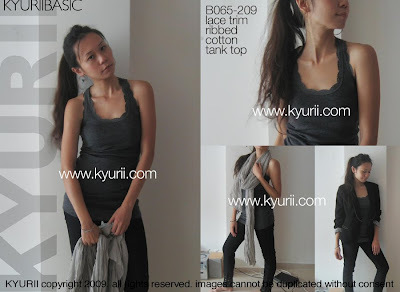 great to layer it loosely over your tank top. grey over our new basic white or light pink tank, matched with that faded blue ripped skinny . for the magenta one, i like it over dark grey tank with light grey acid wash skinny. please watch out for this grey puff sleeve hoodie. my favourite item this week. i love the flattering tapered waist. i love it with leggings. yes we have 3 tees this week. all on the nature theme! yes! butterfly, flower and a reindeer. i really like the pale purple of this tee, i think i bought it mainly for the colour. its so hard to find a pale purple tee which i want to go with the grey skinnies you see. haha... and the lovely pink butterflies graphics makes it perfect. haha my hair.. anyway. another one of my great finds last week, this hoodie below. the soft colours somehow reminds me of stella mccartney stuff. haha i duno.. but i am glad the choice of all 3 colours are great and they look harmonious together. you know how sometimes, you like the item so much but one of the colours is just way off. oh things like that drives me nuts. haha.. i am glad this one done really well, i have to say. ok next, is this pair of patchy legging. one of 2 pairs of leggings we are launching this week. love love love. becos of the deep blue with purplish colour. sometimes black legging is just too bland. this is a great alternative! very comfortable too! yeah flowers! 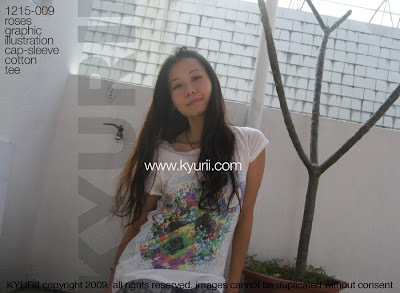 i love flower tee! i never get tired of them actually. time to bloom!! studded tunics. haha cant get enough of them this season. hee... 2 colours to choose from. this pale purplish grey one and black. i like this grey one which you can wear it belted with black legging. this is the reindeer tee. haha xmas is round the corner so we have to have a reindeer. also becos i love deers. haha.. and animal tees. i love the length, it just covers my hip, which is perfect for legging under it! plus bomber jacket over it when the weather gets cool. 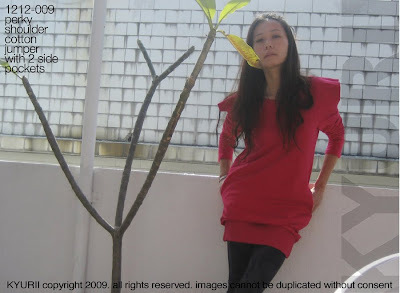 this sharp pink jumper i love! still making shoulder statements. i like the shoulder effects which makes the whole look more interesting. sweep your hair back into a neat ponytail and do a energising sporty look this coming weekend. ok one more item to look out for, its not just a black zip up hoodie. it has double zips for you to choose between a loose or body hugging fit. zip accordingly! see it in details tomorrow. very versatile piece. great for both M and S size girls. 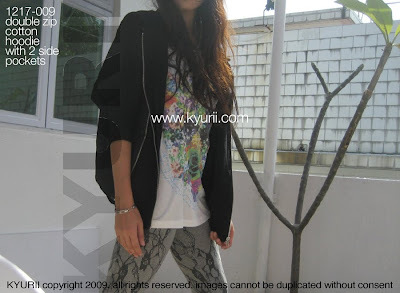 the other legging we have this week is this one, which has lace-like printing on. its grey in colour. i think it would be great with the black basic oversized top . sometimes when you get tired of doing it with skinnies, this printed legging would be nice for a change. we are also launching a nice little cotton tank top for you to mix and match. comes in 4 colours: black. grey, baby pink and white. Dear suyin sis, haven been talking to you in the longest time. been busy with work and other stuff. just saw the launch. many pieces are great for yoga! saw the painting you did for your friend and it look soo good. it reminded me of what my friend did when he was at lasalle- draw and paint 1000 eggs within 3 days. he bought several trays and rotate the eggs as he changed his perspective on them. how did he do it? I am flying to taiwan this mid-night, going for religious trip there. returning on 23. lets catch up then. Regarding the poses on your roof top floor --> HAHa. take care of yourself. so nice to hear from you! please enjoy your trip to taiwan and have a good break from your busy work. you take care of yourself too. i am going up to paint now. sending you love and light from my roof haha.... catch up when you are back.